Requiem Breakdown are a brand-new duo making music out of Spanish Fork, Utah. The group consists of rappers/producers LovE and Swirv, who describe themselves as a mix of hip-hop, electro and dopeness. Zonkers is the first full-length release by Requiem Breakdown and was met with unexpected enthusiasm, getting 35,000 streams on its’ first day of release. 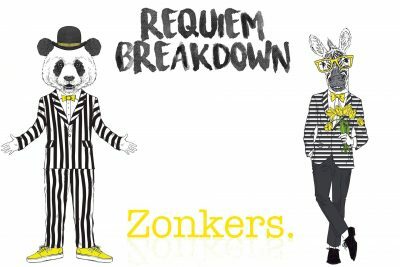 With all the hype and anticipation leading up to the release, plus a strong online presence on SoundCloud and YouTube, Requiem Breakdown had big shoes to fill with the release of Zonkers. The group combines a funky, feel-good style with more mainstream-sounding hip-hop throughout most of the album. The single “Billboard” is pretty catchy, with well-crafted lyrics, a good hook and a sing-song, simple chorus. Songs like “Serial Friends” are trappy and downtempo but still combine lyrics that are filled with quality metaphors. The lyrics in each song are varied and versatile. Requiem Breakdown joke about serial killers but also keep it real, talking about lost love, partying and life in Utah. Throughout the album, the production is strong, employing a lot of reverb-filled samples and well-mixed bass sounds.